Gor Mahia forward Jacque Tuyisenge (left) shields the ball from USM Algers' Farouk Chafai during their Caf Confederation Group D match on May 16, 2018 in Nairobi. Nairobi — Gor Mahia's dream of making it into the CAF Confederations Cup quarter final for the first time in their history came crushing down on Wednesday evening after losing 2-1 away to Algeria's USM Alger at the 5th July Stadium in Algiers. Coming into the final round of matches sitting top of the standings, Gor needed at least a point to progress to the next round but found themselves chasing the game with goals in either half from Prince Ibara Amir Sayoud saw USM get victory. 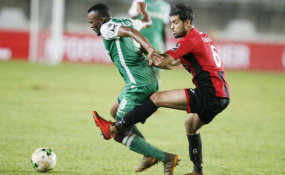 Jacques Tuyisenge scored late on for K'Ogalo but it never bore the confidence for a valuable equalizer. Rayon Sport beat Yanga in the other group match played concurrently in Kigali, Rwanda with the result seeing USM finish top of the group with 11 points, Rayon second with nine while Gor finish third in the group with eight points. The Kenyan champions will rue their loss against Rayon on August 18 in Nairobi in a match that they only needed a point from to confirm their place in the group stages with a game to spare. A point against USM would have seen Gor go through ahead of Rayon on goal difference. Gor head coach Dylan Kerr handed keeper Peter Odhimabo a start ahead of Boniface Oluoch after his impressive displays against Sofapaka and AFC Leopards in the Kenyan Premier League. He set out a solid group behind him with Philemon Otieno partnered in midfield with Ernest Wendo as Joash Onyango went out left of defense and Charles Momanyi partnered Harun Shakava in the middle. The home side knowing they needed a win to assure themselves of a slot in the quarters started brighter and in the ninth minute, they had the opportunity to go up ahead when they were given a penalty after Harun Shakava handled inside the box. However, keeper Odhiambo repaid the faith shown in him by the coach saving from Mohammed Meftah with his feet, the USM midfielder's shot straight through the middle blocked. This was the third penalty Odhiambo was facing in as many games. He saved in the Sofapaka match while in the AFC tie, Whyvonne Isuza's strike went wide. USM continued to pile in the pressure and two minutes after missing a penalty, they attacked again and Joash Onyango had to throw in an important boot to pluck the ball away from Ibara's head as he lurked behind to head home off an Abderrahmone Meziane cross. Yaya Faouzi should have broken the lead in the 32nd minute when he was senbt through with acres of space on the right but he couldn't wrap his foot well around the ball, his shot going wide. But three minutes later, Gor found themselves a goal down when Ibara's looping header unmarked from the right found the defense and keeper Odhiambo flat footed from a corner. Gor were punished when no one picked up Ibara, as the Kenyan champions resorted to zonal marking which found the attacker isolated and headed in with ease. Odhiambo was called into action in the 38th minute to parry away a stinging header from Faouzi off an Ibara cross from the left, the lanky striker having done well to skip past Momanyi. Gor tried to pick up in attack in the final five minutes of the half and Jack Tuyisenge had a chance in the 41st minute but his left foot shot inside the box went straight to keeper Mohammed Zemmamouche's arms. At the stroke of half time, a beautiful build up play from Gor saw Tuyisenge cut back a cross for Francis Kahata inside the box but his shot was blocked for a corner. USM kept the pressure in the second half and on the hour mark they had a chance when Meftah's freekick came against the wall and Abderaouf Benguit's shot from the lose ball was blocked for a corner by Wendo. In the 62nd minute, the home side had another chance from a set piece again and it was that man Meftah again, but his shot flew inches over the bar. Gor made attacking changes, Samuel Onyango coming on for Karim Nizigiyimana as Gor went three at the back with an urgency of getting an equalizer and probable winner. They kept the push and came very close after 78minutes when Harun Shakava's freekick from range was well saved by the keeper who also bounced back to keep away the rebound from Tuyisenge. Immediately, the home side rattled that Gor were in it to score went 2-0 up, two substitutes combining with Moktar Benmoussa squaring back a pass for Sayoud to slam home unmarked at the edge of the six yard box. On the turn after the restart, Gor, halved the deficit when Tuyisenge nodded the ball home from a Francis Kahata corner and despite the keeper managing to put a palm on it, it had already crossed the line. Despite some late effort to salvage something off the match, Gor were unlucky with Rayon holding on at home for the slim 1-0 win over Yanga that sailed them through.